When a storm leaves our nameless protagonist shipwrecked on a desert island, he naturally turns all of his efforts to escaping his plight. Unfortunately, every raft he builds is destroyed by a giant red turtle whenever he sets out to sea. In his frustration, he attacks his nemesis, only to find that it later transforms into a beautiful young woman. As the man gets to know his new companion, he starts to abandon his thoughts of escape, in favour of building a life with her on the island. A co-production of Studio Ghibli and a European studio, The Red Turtle is a film that transcends language – not least because it lacks dialogue of any sort. The plot may seem slightly unusual – how often do oversized turtles turn into beautiful women, even in anime – but it also comes with a powerful simplicity that ensures that the spoken word is not needed. We never learn the name of our protagonist, but we feel for him at every stage of his life, from the frustration and anger of his early failed attempts to leave the island, to the tenderness of the relationship he forms with the turtle-woman. With every event that befalls the couple, we find ourselves either cheering on their happiness, or desperately hoping that they will be okay. And when the curtain finally falls on their tale, we depart wordlessly, but none the less emotionally moved by the experience. 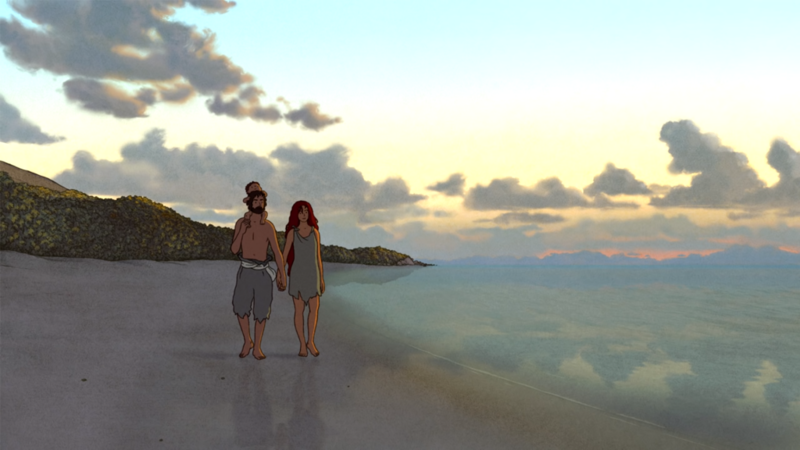 Visually, the animation is clean and simple, but with a richness that adds to life on the island. Entertaining flourishes like the trials and tribulations of a succession of tiny crabs inject some light-heartedness into proceedings. And while there is no dialogue, this is not a silent film – there are plenty of sound effects and a stirring soundtrack designed to enhance the emotional impact. Clearly a lot of work has gone into making such a simple and streamlined movie as The Red Turtle, and it’s an effort that viewers can appreciate. If you want to be immersed in another world for a couple of hours, this is a good choice. It wouldn’t be fair to review The Red Turtle on anything other than its own merits, but it’s worth giving the film credit for being enjoyable despite the uncomfortable circumstances under which I watched it. A screening was put on at a local pub in October as part of the Cheltenham Literature festival, and given that said pub shows a lot of films, I foolishly imagined they had a decent set up. Not so – it was just a room way out the back of the main pub, with a handful of uncomfortable seating options, and so much light streaming in that had the film had subtitles, I wouldn’t have been able to read any of them. In fact, I had to abandon my plans to stay for the subsequent screening of In This Corner of the World, as the thought of an additional two hours of discomfort was more than I could bear!